Friends and supporters will be staging an art show benefit tomorrow night Friday, Nov. 14th, at Nemo Design headquarters in Portland, Oregon 7pm to 11pm. Suggested donation $10. 1875 SE Belmont, Portland, OR. Featuring timeless works from too many legendary snowboard media luminaries to mention, from Brunkhart himself to Dano Pendygrasse, Trevor Graves, Ari Marcopolous, Andy Wright, Jeff Curtes, and 50-plus more contributors, this may be the greatest collection of snowboard imagery and artwork ever assembled in one place. Additionally, we have a limited number of signed copies of Brunkhart’s timeless “How Many Dreams in the Dark?” available for sale with all proceeds going directly to Chris. 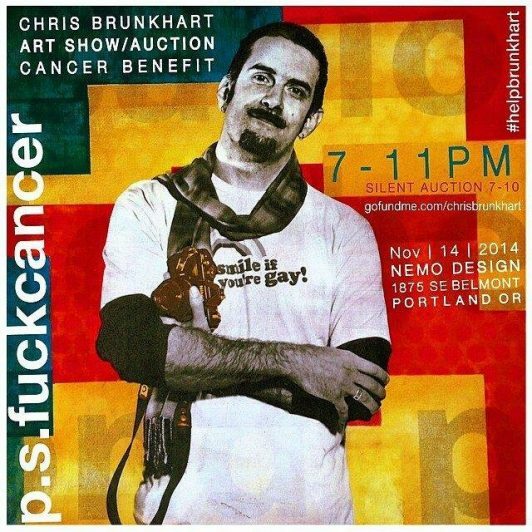 If you can’t make it to the show and don’t want to buy a book but still want to support the cause through charitable donation, visit www.gofundme.com/chrisbrunkhart.